"Do you want to go to church today?" "Oh, well... it doesn't take long to lose that fire. Huh?" But little did my grandmother know, I was already armed to the teeth. "If you're trying to make me feel guilty it's not working." I could tell she was speechless. "I AM trying to make you feel guilty." I will never forget that conversation on the phone. It would tear my grandmother apart if I ever told her, but I wish that I would have never had anything to do with the faith. I was brainwashed very early on. Equally by both my grandmother, who would make sure I went to church, and by the church itself. My first memories were in the church. As such, I was not the same as every other child. I did not do things like read harry potter, or be a problem child, by choice. I did not see myself as a tough kid, nor did I want to be. I wanted to be the nice kid. I wanted to be the Christian. Throughout my childhood and most of my teen years, I held onto the obligation to be the Christian influence in a world oozing with sin. I spent most of my time outside of school playing video games. What else was there to do? Hang out with friends? I would not dare to, they're not Saved. I will not hang around chickens when God is wanting me to be an eagle. Girls? What about them? It had been hammered into me: don't worry about all that. It's only going to lead you off of the narrow path. Plus, I never thought a girl would ever be interested in me anyway. And also there were the fellow church members who had been in the faith 3 times as long as I'd been alive, who all had their testimony of the dead and dreadful world outside the church. In junior high, at church camp, during a service the pastor prophesied that I was called to be a writer. The irony is hurting. Trust in God, he has a plan for my life. and it went on like this... until I was 17. One night I was snapped out of it, by a girl. She gave me her number and what I found out when she texted me later than night shook, destroyed, the foundation of my way of life. It was unfathomable... she thought I was cute and she wanted to get to know me. It was overwhelming, I was scared. I would tear up at night because I was so overwhelmed by it. I was a senior in high school and I felt like a junior high kid. It flew right in my face, I never thought it could happen. (I'm going somewhere with this I promise). I knew what the Bible wanted me to do, which was to just blow her off. But I couldn't, I didn't know if this was ever going to happen again, and also... she was just pretty. As I grew out of this Christian way of thinking, I learned more about life than the church has ever taught. I was telling a few classmates about this (minus the crying part), and it was the first time I could ever remember a group of individuals genuinely listening to me while I was talking about something other than video games. And for the first time I was taking advice from a source other than the bible. Over the course of the next few months, as I grew out of this Christian way of thinking, I learned more about life than the church has ever taught. These kids who did not go to church aren't lost souls looking to find purpose in the wrong places, they're just people, and we are in no way more genuine than they are. All these "lessons" and "revelations" that have been taught to me haven't helped me actually get by in life. They have, maybe, made me a more wise human being, but those who do not live by the Bible are capable of making good life choices too, if not better. Heck, I learned for the first time that if you quit worrying about feeling guilt you can enjoy life much more. And was not making friends with these "non-believers" a good thing? Some of these kids are intelligible people. Are these rules really making life better? Staying inside and playing games like a good kid was eating away at my life. I had a messed up sense of self-worth, and a worse sense of self confidence. Because without God, I was NOTHING. Just a soul on the way to Hell. I sacrificed my childhood social life, to be a better person. I'm still pissed that I found out what it was like to be a teen right when it all is supposed to end. Christianity ruined what could have been an awesome childhood. I am now an adult, struggling with adult stuff... like my viewpoint of religion. I'm now 19, it's been 2 years since that event, and I'm still struggling. Mainly Because I spent most of it trying to make sense of it all, or justifying it. Rather than trying to take off the boundaries of Christian like thinking, which has helped a lot, but not entirely. Like, I'm so glad that I'm not the only who has found holes in the creation story. If God knows everything that will ever happen, he'd have known that the serpent would try to trick Adam and Eve. Really? You sent your only begotten son to die that horrible death so that you could fix what Adam and Eve did, when you KNEW it was going to happen? If it's his will that none shall perish, than why do these people get sent to Hell? You KNOW these people are about to die and go to Hell, which was absolutely NOT your will... yet it's happening. But I'm getting off topic. Thinking outside the lines drawn by the church has helped. I now realize that studying my Bible and going to church didn't help me get good grades, or make friends, or get a good job. And when I do stuff on my own, I get to take credit. I can't stand when athletes and Oscar winners say "I give all the glory to God." But you worked hard for that. You don't get to take any of the credit? I know it may not make sense... but I wish I could be an atheist. But I just can't. Hey atheists? Yeah, you. You want evidence? Google it. The X-Structure of the Messier Galaxy 23 million lightyears away. Look at pictures of a protein in our bodies called laminin. Ever heard of Schrödinger's Cat? I am looking to make an educated decision as to which path I choose take, rather than dive in without fully understanding both sides. And I want to be able to use my brain and my own way of understanding. 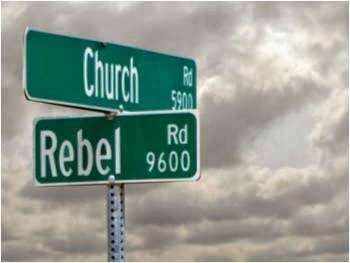 If the Christian faith does not allow that, than I am one step closer to deciding.